My ears started stinging with about two minutes left in the game. 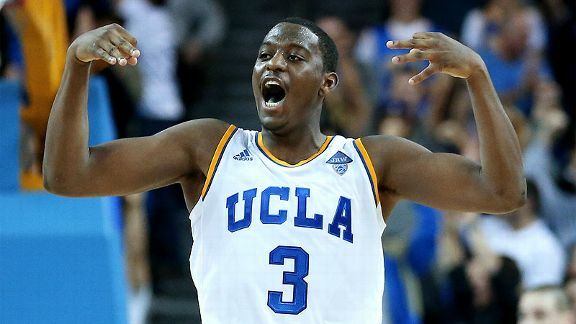 That’s around the time when Jordan Adams, who was having a miserable shooting night, drilled a 3 that brought UCLA all the way back to a tie with no. 1 Arizona, 68-68. Ryan Hollins’s face came up on the JumboTron, and amid the roars there was an audible “YEAH, RYAN,” easily making for the largest ovation Hollins has gotten in at least seven years. With no other team in L.A. playing last night and the no. 1 team in town, UCLA had the eyes of the city to itself. 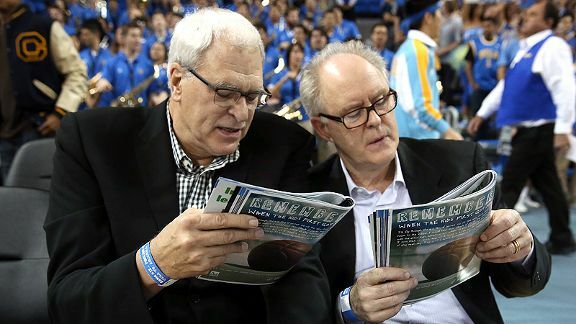 The stars came out: Flea performed the national anthem in a UCLA jersey and teal pajamas; Gilbert Arenas (looking good) and Baron Davis (looking chunky but mad comfy) came in support of their respective former programs; Phil Jackson and John Lithgow were L.A.’s answer to James Dolan and Katie Holmes over in New York. As for the game itself, Pauley Pavilion was in a frenzy as UCLA fought back from a 13-point deficit with six minutes left. The Bruins tied it with just under two to go. Conditions were perfect for an upset, and a win against the Wildcats would have been the school’s 11th against a no. 1–ranked opponent, second most in NCAA history. It wasn’t to be. UCLA took a one-point lead, its first and only advantage in the second half, and kept it for all of 18 seconds. In the last minute, the clouds over Arizona lifted. The Wildcats attempted 10 free throws in the final 63 seconds of the game, and that turned out to be the decider as the visitors won, 79-75. As you might guess from his box score, Jordan Adams wasn’t having a great night. Adams has acquitted himself well as the team’s primary option on offense this season now that he’s stepped out of Shabazz Muhammad’s shadow, but he really didn’t have many answers against Arizona’s superior defense. But Adams is nothing if not a gamer. Midway through the second half, he went full-on berserker. In a span of less than two minutes, he corralled five rebounds, three of which were offensive (he’d finish with six offensive boards, 11 total). He dove for loose balls and made the requisite energy plays that greased the wheels for a late-game comeback. Whatever disadvantages he had against Arizona’s athletic defense, he made up for by wanting the ball more, using every bit of his Lance Stephensonesque 6-foot-5, 220-pound body to create second-chance opportunities he had no business creating. He couldn’t swing the game in UCLA’s favor in the end, and you wonder how different the outcome would’ve been if he could’ve made another shot or two, but watching Adams scrap in the second half was a real pleasure. The narrative surrounding this Arizona team is nothing you haven’t heard before. It’s a team that has truly bought into Sean Miller’s guidance, and the players have bought into each other. Aaron Gordon needs a breather? Sure, let’s bring in Rondae Hollis-Jefferson, a player as energetic and versatile on both sides of the ball as Gordon is. Can Arizona go small? It sure can, and did last night, with T.J. McConnell, Nick Johnson, and Gabe York sharing the court for stretches, terrorizing UCLA from inside and out. Nick Johnson, the team’s leading scorer and a Player of the Year candidate, will take on the opposition’s best perimeter threat without flinching. Most of the NBA scouts in the building came to see Gordon, and while his stats won’t ever blow you away on a team this deep and talented, you get an experience watching him play that isn’t unlike seeing Shawn Marion in his prime. When he wasn’t finishing reverse-dunk alley-oops, he was admirably defending Kyle Anderson out on the perimeter. Then he would finish another alley-oop. It’s hard not to come away impressed and a little terrified by this Arizona team, even though it squandered a 13-point lead. There are no significant holes with this squad. And when you have the option of unleashing explosive talents like Hollis-Jefferson and York off the bench at a moment’s notice, you can forget about modesty. On its best day, this is a team with enough talent to bludgeon the rest of the field. Let’s take a moment to appreciate Kyle Anderson’s existence. Without him, the Bruins could not have managed the 13 points in three minutes that pulled them back in the game. He’s UCLA’s primary facilitator, 6-foot-8 with a 7-foot-3 wingspan, and he’s quite possibly the slowest player his size to ever play at a high level. He’s completely cognizant of his limitations, wearing his “Slow Mo” nickname with pride, as he should. His use of hesitations, fakes, and weight-shifting is next-level — it’s as if his defender is entranced by watching Anderson move so slowly in real time that his own reaction time is forced to adapt. Then, once the defender finds himself playing in Anderson’s time signature, it’s too late. He merely adopted the slow. Anderson was born in it. Thanks for carrying the torch, Slow Mo. Something that never got old for me: Whenever a Bruin made a free throw, a rotating pair of UCLA cheerleaders would do a backflip on the other end of the court. UCLA made 19 free throws. There were 38 backflips last night. If you were to string those backflips into one continuous motion, UCLA’s cheerleading squad would roughly have the same rotational speed as a Lil’ Flip vinyl record. I’ll be honest: I didn’t put a circle around this date on the calendar because I needed more Pac-12 action in my life. The date was circled the second Chad Ford made Zach LaVine a prospective lottery pick for the 2014 NBA draft, based on several scout evaluations. His name didn’t exactly come out of nowhere, but there might not be another player who has made this kind of leap into draft consciousness. LaVine offers glimmers of his remarkable talent. He’s one of the most explosive players in college, but hasn’t quite figured out how to best leverage his athleticism on drives. He contorts his body in awkward ways that lessens the force he generates upon liftoff and leaves his body off balance. Balance is an issue for most young wings, and LaVine is no exception. But again, there are flashes. With less than 24 seconds remaining in the game and UCLA down 77-72, LaVine effortlessly and instinctively launched a 30-footer on a catch-and-shoot. Straight up, straight down. He made the biggest 3-pointer of his young college career in front of a sea of NBA personnel with complete balance and complete confidence. It didn’t win the Bruins the game, but it might win him a lot of love come June, should he decide to make the leap.